They will be released on CD, one a month, starting September 2009. The stories take place after the end of season 15, when the Doctor left Leela and K9 Mk1 on Gallifrey, and before he began traveling with the first Romana in season 16. The first story, Hornet’s Nest: The Stuff of Nightmares involves the Doctor deciding to take some time off in Sussex in 2009. Of course, he soon gets involved in another adventure, and is joined by third Doctor companion and former UNIT captain Mike Yates, played once again by Richard Franklin. The story is followed by The Dead Shoes, The Circus of Doom, A Sting in the Tale, concluding with Hive of Horror. Personally, I can not wait to get the CDs later this year. 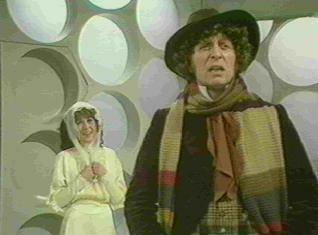 I grew up watching Tom Baker on PBS in upstate New York back in the 1970s and ’80s, and he was “my Doctor”. I had my doubts about the rumor I mentioned earlier, since it had him returning on the TV series, but this makes much more sense, given his age. Baker has repeatedly turned down appearing on the excellent Big Finish audios which have featured many new stories from Peter Davison, Colin Baker, Sylvester McCoy, and Paul McGann. I don’t care what got him to change his mind; it’s going to be awesome to hear new stories with Tom as the Doctor! You can click to read the full interview with writer Paul Magrs on Outpost Skaro. *No, I’m not counting “Dimensions in Time”. That definitely doesn’t count in any way and is best forgotten. It is filed under Classic Doctor Who Series, Doctor Who, Doctor Who Audio, Doctor Who News, Fourth Doctor Tom Baker.